EW: You guys first became filmmakers at a time when European directors were arguably the most inventive and the most artistically acclaimed in the world. Do you miss that atmosphere? LUCAS: When Star Wars was being made, all the independent art films [still] came from Europe. There were practically no American independent films being made. Now about 30, 40 percent of American films are independent. And the films coming out of Europe, a lot of them look like American films. You can’t really tell the difference. There’s a globalization of entertainment, and it’s good, because you still have personal art films and big audience pleasers. 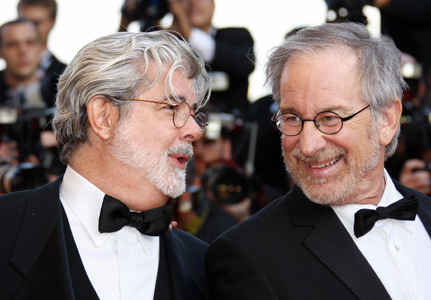 SPIELBERG: You also have films being made and released on the Internet, little films, five- to six-minute shorts. They come from all over the world, and it’s really interesting to see and to sense how this world has shrunk down to size of a single frame of film…. More people can pick up video cameras, and more individuals can express who they are as artists through this collective medium. That’s what’s so exciting. What makes me really curious to see as many short films, especially, as I possibly can, is that everybody is coming out of a different box, and is free to express themselves because budget is no longer a limiting factor. You can make a movie for no money and basically get it out there on YouTube for everybody to see. LUCAS: Movies are now becoming like writing, like books. It’s opened up to the point where anybody who has the urge or the talent to do it, there’s not that many impediments to making a film. And, there are not that many impediments to having it be shown. That’s where the Internet comes in. Now you can actually get it in front of people, and have them decide whether they like it or not. Before, that depended on the decisions of a very, very small group of people — executives who in a lot of cases didn’t even go to the movies, and didn’t even like ’em. And they were deciding what the people were and weren’t going to like. It’s much more democratic now. The people decide what they want. EW: Of course, there are downsides to the burgeoning Internet age — and one of those downsides is, when a popular movie is coming up, people sort of peck it to death before it even opens. There’s been a huge amount written on the Internet about the development of Crystal Skull, including lots of spoilers on chat boards — though most of it is clearly labeled. Is it getting harder to protect the development process? SPIELBERG: It really is important to be able to point out that the Internet is still filled with more speculation than facts. The Internet isn’t really about facts. It’s about people’s wishful thinking, based on a scintilla of evidence that allows their imaginations to springboard. And that’s fine. LUCAS: Y’know, Steven will say, ”Oh, everything’s out on the Internet [in terms of Crystal Skull details] — what this is and what that is.” And to that I say, ”Steven, it doesn’t make any difference!” Look — Jaws was a novel before it was a movie, and anybody could see how it ended. Didn’t matter. SPIELBERG: But there’s lots and lots of people who don’t want to find out what happens. They want that to happen on the 22nd of May. They want to find out in a dark theater. They don’t wanna find out by reading a blog…. A movie is experiential. A movie happens in a way that has always been cathartic, the personal, human catharsis of an audience in holy communion with an experience up on the screen. That’s why I’m in the middle of this magic, and I always will be.